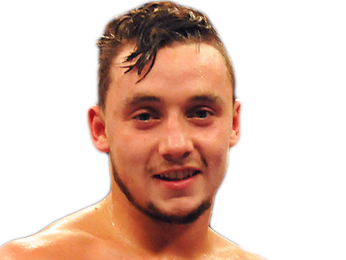 Born on November 24, 1992 in Harrow, London, England, Mitchell Smith combines solid punching power with a ferocious style and plenty of swagger. He started boxing when he was just six years old after getting bullied, and at 11 he had his first amateur bout. He ended up winning multiple national amateur championships, including the Senior ABAs in 2011. After that, Smith decided to turn pro. His first professional fight was on June 1, 2012 against James Ancliff. He showed off the power and aggression that would carry him through several subsequent fights, as he took out Ancliff by TKO in the third round. Barely a month later on July 5, he took on Dan Carr and was awarded the decision on points after four rounds. In his next fight, he beat Pavels Senkovs the same way. Only a week after his victory over Senkovs, he fought Ibrar Riyaz and won again on points, this time after six rounds of action. To close out the year, Mitchell Smith fought Igor Tsujev on December 15. He got another opportunity to show that he could put together powerful punching combinations, as he finished off Tsujev in the fourth round by TKO. After an active 2012, he had a few months off before his next fight, which was against Gavin Reid on April 20, 2013. He won again by TKO, and this earned him a first title fight for the BBBofC Southern Area super featherweight title. The fight took place on September 21, 2013, although it wasn’t against high-level competition, as he fought the 7-7-1 Scott Moises. Smith ended up winning the fight on points after 10 rounds. He then took on the undefeated Mark Evans and stopped him by TKO in only the second round. His next fight was against another undefeated fighter, Peter Cope, for the BBBofC English super featherweight title, and he won a unanimous decision after 10 rounds. He then fought the 11-4 Zoltan Kovacs for the WBO European super featherweight title, and collected another belt with a 10-round unanimous decision victory. Mitchell Smith gained notoriety in his next fight, where he scored a beautiful TKO finish of Antonio Horvatic. Horvatic was only 6-14 at the time, but the precise four-punch combination that Smith used to secure the stoppage got him quite a bit of attention online. That victory also got him another title fight, this one for the WBO Inter-Continental super featherweight title against Cristian Palma on May 9, 2015. It was another decisive victory as he knocked out his opponent in the fifth round. He did even better in his first defense of that title, stopping Dennis Tubieron by KO in the first round. Things didn’t go as well for him in his next fight. He slacked off with his preparation to fight George Jupp on December 19, 2015, and it cost him. Not only did he come in overweight, but he also lost his belt to a unanimous decision after 12 rounds. He took some time off and came back on October 8, 2016 to stop Norwin Galo. Sorry, no fights sheduled for Mitchell Smith at the moment, check potential opponents & fights below. Sorry, we don't know of any potential fights for Mitchell Smith at the moment, why not send us some suggestions? Sorry, we couldn't find any with fights scheduled with odds for Mitchell Smith, please check back soon. Sorry, we couldn’t find any ticket details for Mitchell Smith at the moment.